There is work to be done, errands to run, kids to drop off and pick up from school, a lunch date with your friend, meals to be made…it’s a busy day! As if that isn’t enough, you are trying to stay healthy throughout it all. We can all relate to this in some way or another. Life is unpredictable, and staying on track with your health takes focus and intentionality – and even more so if you are trying to keep your hungry kids happy and healthy too! The struggle between busyness and healthiness—and the balance you seek between them—is a relatable one. We are here to help. Sometimes the best (and easiest!) option to take a bit of the pressure off is to simplify, and one way in which you can do this is to rework your kids’ snack-time routine through easy, grab-and-go fruit. It’s hard for kids to resist fruit. It is sweet, brightly colored, and fun after all! Luckily, fruit is one of the simplest and healthiest foods out there. They are the perfect way for you to incorporate nutritious foods into your children’s diet, while also taking some of the weight off your shoulders. So, what fruits are best? Here are five, kid-approved fruits that we know your kids will love! Domestically available from April until September, these little guys truly are a powerhouse of health benefits. At only eighty calories per cup, blueberries are high in both Vitamin C and dietary fiber, while also being high in manganese. Impressive, right? Not to mention, they taste so, so good, and kids love them because they’re small, sweet, and easy to eat by the handful. Another perk of blueberries is that they can be consumed in numerous different ways. Serve them fresh (or freeze-dried!) for an after-school snack, throw them in some yogurt for a quick breakfast, or even whip up some blueberry muffins to pack in your kids’ lunches. They’re healthy, they’re quick, and they are irresistible. What’s not to like about this versatile little berry? Mmmm plums. They are the perfect fruit when you’ve got your eyes out for something juicy with just the right amount of tartness, and your kids will think so too! Plums have a low glycemic index score, which is great because they don’t negatively spike your blood sugar levels. Not to mention, they are a good source of fiber and are heart-healthy. Store your plums in your fridge and have them as a grab-and-go option for when your kids need a quick snack since they’re just the right size to fill your kiddo’s tummy until dinnertime rolls around. Available from May until early October, make sure and grab some on your next grocery run because these guys go quick! These are a classic snack for kids. Crunchy and sweet, red grapes are a wonderful source of Vitamin K and are also a good source of antioxidants. Stock up on them in one grocery run (look out for them in autumn, when they are at their peak of ripeness), and then keep them in your fridge and freeze the rest as a snack you can come back to. Even better, throw freeze-dried grapes in a salad, and then your kids can be eating fruits and veggies in one go! 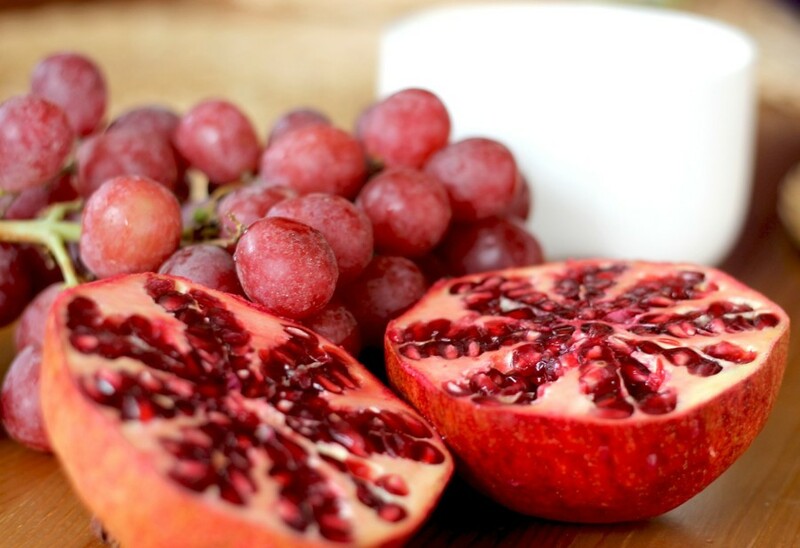 Often overlooked in the fruit category, pomegranates are a unique treat that packs a powerful punch of delicious taste, beautiful coloring, and exciting texture, all into one bite. Not to mention, they’re mind-blowing in the health department. Pomegranates are known for their powerful antioxidant properties, along with being heart-healthy, a ward against cancer, helpful for your stomach, and also a good source of vitamins A, C, and E.
What’s so handy is that pomegranate seeds are readily available in stores, so you can have them ready to go without the hassle of extracting the seeds from the fruit. (But we suggest you try our organic pomegranates sometime, they’re to die for!) They fit perfectly in your children’s school lunches and they also make a good breakfast when paired with granola and yogurt. Keep an eye out for them starting in October and all the way into January. Oranges, as you very well may know, are a wonderful source of Vitamin C, which, for your kids, is ideal because it helps to keep them from getting sick. Plus, they are high in fiber and Vitamin A. Oranges are such a fun snack because their bright and tangy flavor is different than the sweet flavor you typically find in fruit. Kids love oranges because it is an adventure to eat each little piece. Pick them up between late November and early April for an easy go-to and watch your kids smile as they have fun with such a healthy snack! So there you go! Simple, fresh fruits that are perfect for your busy lifestyle. Hopefully, we were able to help give you a refreshing point of view and take some of the pressure away. Do you have any other favorite, go-to fruits for your kids? Let us know on Twitter, Facebook, and Instagram, and check out our “Kid Friendly” board on Pinterest for some other fun, kid-approved snacks!